Yes, a lonely tomato on a plate of Summer squash at Monte Vista Organics table on Saturday 8/1. A slow start but it will happen now very fast. And YES the Caprese Salad and the Margherita Pizza are available now as long as supplies last. For the 20 years we have been making this pizza it has gathered a serious following. Why? What could be more simple than a cheese and tomato pizza? Well . . . here’s the secret – we don’t do it all year round. I don’t care what kind of tomatoes you bring us in off-season, nothing comes close to creating the necessary flavor that makes it worth Roland’s effort to make this pizza until he gets Dave Fresques’ (and many other great NM farmers) sweet, luscious, earth-grown, sun-ripened, organic, heirloom tomatoes. 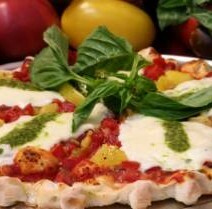 Of course the other unique ingredient is our fresh mozzarella which is made in house 2,3,4,5 times a day, as needed. Roland is known by some as the mozzarella king and I must say I have never tasted better than his never-refrigerated, minutes-old fiore di latte (flower of the milk). Do not let the season go by without enjoying this extraordinary Margherita pizza or Caprese salad. For those who are GF, we can do it as a small pizza – almost as good! this has been a fabulous season for late growing. Today is October 16th, the night time temperature is 48F ( 5am) and it looks like there is no frost in sight for another week. First frost ends the tomato season for Joe’s Dining and usually that is the first week of October. Come by and enjoy this special late treat.